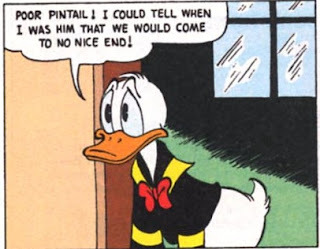 Duck Comics Revue: "Back to Long Ago"
I'm a big fan of this story, from 1956. It's kind of low-key; not as flashy as some Scrooge stories (actually, it's really more of a Scrooge and Donald story). Although it seems like there ought to be some sort of message, it's hard to really get to the bottom of it. Still, while it's partly nostalgia on my part, perhaps, I think there's a lot to be said for it. Scrooge sees that a tenant is three months late with the rent and determines to evict him. So he pays a visit to the dude, who turns out to be a hypnotist. 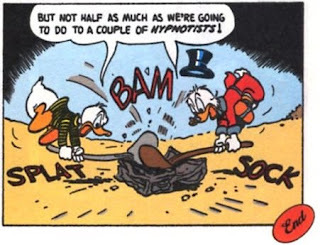 He tells Scrooge tales of previous people he's hypnotized who have thereby found great treasure, and don't you just love how Barks depicts these plutocrats? Do these not look like caricatures you would see in the Daily Worker? 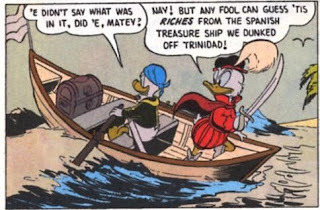 Anyway, Scrooge, seeing dollar signs, agrees to let the dude hypnotize him in lieu of paying, and we get an awesome two-page flashback of Scrooge and Donald as sixteenth-century English privateers burying treasure on a deserted island. Their accents are fantastic; one wishes the whole thing would go on longer. It really creates a sense of history (not so much here, but in my edition the flashback section is slightly sepia-ish)--and there's also some genuine pathos here, as HDL research the ship and find that it went down all hands aboard three days later. But we are getting ahead of ourselves. 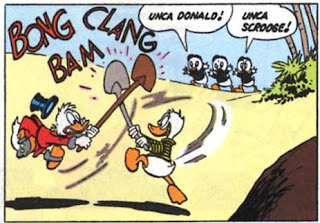 Scrooge dashes off for the treasure, only to run into Donald, who was similarly hypnotized. Note how, in the second panel there, they appear to have been momentarily jolted out of their historical moorings--the divide between past and present appears permeable. But to what extent is this the case? Keep that question in mind. Now it's a race to see who can get the treasure first. Scrooge is not exactly scrupulous here, purchasing all the seats on the plane to keep Donald and HDL off. 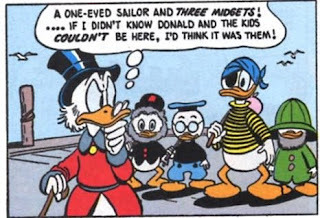 Now Donald is regressing back to pirate mode. There's nothing to be done about it now, so once Don has revealed himself, they both go ashore. SHOVEL FIGHT! It's a great moment, but it also reminds us that there is a difference between past and present. Is the modern world worse than the older one? I don't think Barks is that reactionary, but he definitely seems to be saying something about history, repetition, and how it does or doesn't work. And here it turns out really not to work: the treasure consists of (now-dried-up) potatoes bound for England--new and valuable then; worthless now. All that for nothing. Perhaps--in spite of what one would glean from any number of other Scrooge stories--looking to the past for salvation in an unreflective way is a mistake. Yeah, okay--but I think you're taking out your embarrassment at your own foolishness on an innocent target. The hypnotists showed you the past--you're the ones who decided what to do with it. This is one of my favorites stories, it has it all, adventure, race, humour, history, entertainment, originality, and specially a strong caribbean feeling! Thanks for the entry! "Donald Duck Tells about Kites"
Let us check ourselves before we wreck ourselves. "The Queen of the Wild Dog Pack"